Gamers, meet Plex: The popular media center app is debuting on the Xbox One Tuesday, and is going to come to the Xbox 360 soon as well. It’s the first time Plex has officially been available on a game console, and it’s the first app that brings local and personal media to the Xbox One — so it’s a pretty big deal for both sides. Plex’s Xbox One app will allow Xbox One users to run the [company]Plex[/company] media server on their computer or network-attached storage drive, and then access video files on their network, or even content shared by others over the internet. At launch, the app only supports video, with a focus on movies and TV shows, but Plex Chief Product Officer Scott Olechowski told me that support for photos and music will follow before the end of the year. The Xbox One app will be available Tuesday through [company]Microsoft[/company]’s Xbox Marketplace, and the Xbox 360 app will follow in about two weeks. Both apps will initially just be available to Plex Pass subscribers, which doubles as a early-access program and a premium tier with features not available to ordinary Plex users. However, Olechowski told me that the app will eventually be available to any Xbox One user for a likely fee of $5. 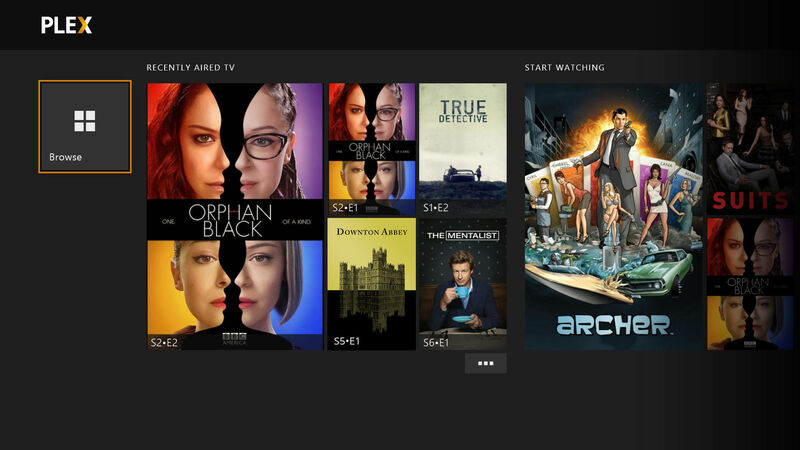 The Plex Xbox apps offer access via voice control and gestures, and come with a new, simplified UI that lets users focus on a single media library / server instead of mixing content from all kinds of sources within the same interface. The Plex team also added a number of features to help with content discovery, including the ability to quickly check out unwatched or new content, and to browse movies or TV shows by actor, genre or even TV network. Olechowski said that Plex may bring some of these features as well as the new look to other TV devices as well, but didn’t reveal any further details. For Plex, bringing an app to the Xbox is a kind of homecoming: Plex is based on the open source media center XBMC, which started out as an app for bringing personal media to Microsoft’s Xbox. “It’s super cool for us to have an app on the Xbox,” given that history, said Olechowski. But aside from that, it’s also a big commercial for the startup. Plex already has apps for a variety of smart TV and connected device platforms, including Roku, Chromecast and Fire TV, but the sheer size of the Xbox audience could give Plex a big boost in user numbers. Microsoft is believed to have sold at least five million Xbox Ones worldwide, and Xbox 360 sales surpassed 80 million units late last year.